! This is NOT a method of direct communication with ANGELIC HAVEN FLORAL & GIFTS for purposes of ordering or rectifying problems. Wanda thank you so much for taking the time to write a review. We appreciate you and your business. It was a pleasure serving you. Thank you so much. We appreciate you and your business. I couldn't be more satisfied with the three arrangements I have purchased in the last few months. They ho well beyond the expected quality and.value. The finished product is far, far, far beyond the pictures on the website. The owner will talk with you and work with you to come up with the perfect arrangement--and it will exceed your expectations. She especially does an amazing job with corsages and boutonniere's--they are exceptional. Thank you Janet. You don't know how very much we appreciate you and your business. You are so kind to let us know you you enjoy our work. Thank you. Out of town order so my daughter would receive a valentine arrangement from her daddy. Arrangement was beautiful but was NOT delivered until the day AFTER (Feb 15) even though I was told by the friendly owner she would MAKE SURE it was there. I would've ordered from another shop had I known this would happen. I am a business owner and was very disappointed in this oversight For my daughter who had recently suffered a break up and needed some out of state TLC from her parents. Karen ,we appreciate you. Thank you for letting us know you thought the flowers were beautiful. Your online order was placed after 2 pm Feb.13. The holiday disclaimer goes up the morning of the 12th stating orders placed past the disclaimer can not be guaranteed delivery by Feb 14th. due to volume. We are so sorry your daughter went through a break up. She is so blessed to have you. My daughter really loved the flowers and stuffed animal. Thank you Celia. So happy she was happy. Thank you for letting us know. This business is a complete failure. I ordered flowers to be delivered for a special occasion that was time sensitive. A day later, I received an email that they could fulfill the order and were closed (on a Saturday!!!!) and would refund my credit card. Now it was end of the next day and too late to send flowers. The window was gone and they ruined the moment. Sonia thank you so much for taking your time to review us. We appreciate it. We hadn't received any orders for Saturday during the week up until 6 pm Friday when I left the shop. your order was place after 9 pm Friday, We are closed on Saturdays due to health reasons . I would be more than happy to make a very nice arrangement for you or your friend. Just call me and give me address to deliver. Thank you again Sonia. Excellent customer service and beautiful arrangement! I will continue to be a customer! Good Commincations. Went out of the way to deliver, Nice arrangement. Thank you so much. you made our day. Thank you so much. As always we loved making flowers for you. Arrangement was more beautiful than the photo; delivered in a timely fashion, web site and online ordering easy to navigate; recipient loved her gift. Thank you SOO MUCH! Today is Friday and you have made our whole week end perfectly! Such an awesome review. We always try to add a little extra to the arrangements. Thank you so much for noticing! Flowers were beautiful and the delivery driver went out of his way to make sure I would receive them. Showed a lot of attention to customer service. Thank you! You made my day.. Absolutely beautiful flowers & they arrived as promised! Thank you for the gift! Thank you so much!!! You are really kind. We appreciate your business. After reading the reviews for Angelic Haven, I decided to go with them w/o checking other places. So glad I used them. I was more than pleased when the arrangement for my Dad arrived. And, surprise, surprise, it came with balloons, too. More than a week later, the flowers still look beautiful. So glad I used Angelic Haven. Will definitely use them again. Thank you so much for trying our shop.We loved making an a arrangement for your Dad. We appreciate your business. Thanks for helping with an out of town order. I also appreciate you could get them same day. Thank you Amanda it was an honor to serve you. Thank you so much!! We appreciate your business. Have a beautiful week! My Mom recently purchased an arrangement for a funeral. The flowers were even more beautiful than they were on the website. If you are from out of town and want beautiful flowers delivered in Lynchburg, feel confident about choosing this florist. Heather thank you so much. It is so kind of you to let us know you were happy. We appreciate your business. Kayte really enjoyed her surprise flowers. I was disappointed that the arrangement had a butterfly and not a heart. I had made a note that Kayte loves hearts. Thank you so much for taking your time to let us know you were pleased with the flowers but disappointed it did not have a heart in it. We won't have availability to hearts until they come in the first of February. A butterfly does not look like a heart, you are so right. That is all we had to substitute with. Angelic always puts together a beautiful arrangement and delivers it on time...even at the last minute. Very impressed overall. One Very Pleased Customer. The arrangement was Gorgeous, ( Breath-Taking) Staff was So Helpful with My Selection. I will definitely order again. Thank You So Much! You're Awesome. Thank you so much! Your happiness with the arrangement for your loved best friend means so much to us. Not everyone has a friend like you in their lifetime. I'm sure she is your very own guardian angel until you meet again. As you said you will see her again. Thank you Carolyn. Thank you so much!!! Penny it was fun making them ! absolutely beautiful! very colorful and smells wonderful!! They are holding up very well. Thank you! Thank you so much! We loved serving you! Always Perfection! I’ve ordered three times from them and would again. Just beautiful. They are always on time and the owner is lovely and great to work with. Thank you so much for your kindness!!! You are awesome!!!! It was an honor to help you!!!!! Your service and quality raise the bar for other florists in the area. Always willing to go beyond and above with your timely delivery in best conditions all the time. I have order on several unique occasions, sending flowers to a friend who having a hard time with anniversary of her parents passing, for a congratulatory honor of a major project well done. Absolutely beautiful, aromatic, with not a single aging flower in the arrangements. I understand that the arrangement was beautiful and my niece was so excited about coming home and seeing it at her front door. If I have a concern it is that I was surprised that it was left at the front door. What if someone took it? I ordered flowers for my daughter at LU to celebrate her making it through her first week of college, and the arrangement was perfect! I'll definitely be ordering from Angelic Haven again! Thank you!! You made our day with your awesome review. We loved doing them and thank you for using us. Have an awesome day! Your website was very easy to use and the selection of flowers for different occasions is wonderful. My recipient received them that same day and they enjoyed them. Thank you. Have a great day. you could not ask for better customer service. I made a phone call over a week before my anniversary to order flowers and candy to be delivered to my wife and they knocked it out of the park for me. Debi asked me a few questions to get to know what my wife liked and I gave her a budget and and freedom to do what they do best. she delivered a beautiful arrangement with candy and a balloon that brought tears of joy to my wife. for that I can't thank you enough you made our 17th anniversary one we will remember. Awesome customer service! I ordered an arrangement for my daughter who was having her first few days at Liberty U. Her first weekend crossed with the anniversary of her father's death date. Angelic Haven Floral & Gifts arranged a special delivery just for her. The arrangement was extra special with that caring touch. Thank you for making my daughter's day a bit brighter. What a beautiful arrangement you made for my wife, she loved it. Thank you too for the balloon, that was an extra touch that I did not pay for. I am extremely pleased, and will enthusiastically recommend your business. As a small business owner myself, I am happy to support other businesses that provide excellent customer service. Thank you so much Bill for you're kind review. We are very thankful for you're business and are thrilled she loved our work! Come back and see us anytime! Thank you, Angelic Haven, for making a beautiful arrangement for my daughter in the Lynchburg area. You went above and beyond what I was wanting! Thanks for adding the cute balloon. Your service is excellent!!!! Thank you so much for taking the time to review us. we appreciate you and your business. We had fun making the flowers for your daughter. Most beautiful flower arrangement I have ever received. The curl under leaves are unique and added to the arrangement which I have never seen before and the colors were wonderful not to mention the freshness of the flowers. Also, the Angel was a good touch, I needed a guardian angel this week. Thank you. Irene thank you so much! You have made our day!! You are so kind and we appreciate you!! Thank you!!!! You made ours!!!!! Landon thank you so much for your kind review. We APPRECIATE your business. Again thank you ! The arrangement was beautifully created and the customer service was beyond words!!! Lorie thank you so much for doing a review for us. We appreciate your business and time more than words also . Again thank you. The flowers were absolutely beautiful! Fresh and arranged perfectly. Thank you for your awesome review. You made our day!! The flowers were beautiful. Delivered a day late, but I ordered them for mother’s day so it was expected and not a problem at all. They were still delivered the day before mother’s day. The arrangement was fresh and beautiful. I would recommend this shop to other people that want floral arrangements. Thank you! Angelic Floral Haven does make timely deliveries. However, they either got my order wrong or sent a substitute without my okay. All attempts to contact the company have been ignored. Neither was my review accepted in their site. Beware. Cheryl thank you for your review. We tried to contact you but number given was invalid. The delivery was an hour and 15 minutes .It is out of our area but We took it over. Upgraded to more expensive plant . She was very nice and really appreciated your gift. I'm sure you didn't realize all of this. Thank you Cheryl. Thank you Cheryl, We are sorry we couldn't reach you but that is out of our control when we are given a wrong number. On the sight it explains when an item is unavailable an item will be substituted of same value. In your case we supplied a 25.00 upgrade. We wish we could have had the item. We went to two places to try to find one personally. Thank you Cheryl. Have a beautiful day. I ordered flowers for my Aunt who had recently fallen. I had absolutely no idea a tornado had just touched down in that area! Debi's electric was off and she could not receive her usual delivery due to the storm damage, yet she insisted on making the most gorgeous arrangement using what she had in stock. She drove through the detours to deliver it to her that very day! My Aunt was so thrilled to receive the flowers, but also to meet Debi, who truly has the heart of an angel. It brought us to tears and I am so grateful to have met her as well. People like Debi are rare indeed. Thank you so much! Going through detours was worth it just to meet her. I fell in love with her. She is awesome! I told her if she ever needs anything from the store or anything to please call us because we are always out delivering. It was an honor just to meet her. She is fun! Thank you again. Beautiful arrangement and on time delivery. Thanks so much for your help with birthday blessings. I live out of state and have used angelic haven numerous times to send flowers to my grandmother who lives in Lynchburg. The arrangements have always been amazing and more than I expected. Thank you so much! We appreciate your business and perfect timing to receive your kindness. We still have no power from the tornado and your review made my day!!!! Amazing service with my online order. I promptly received a call that some of the flowers were not available. My friends received a beautiful arrangement in remembrance of their daughter. Thank you! Shawn thank you for so much for your kind review. That is an awesome idea about the picture with the recipients . Thank you again for that. Have an awesome day; you have made ours. Thank you so much for being so kind and understanding when I called. My friend received her flowers and she loves them. She said to tell you they were beautiful. Thank you do much( the above reply was supposed to have a smiley face . Thank you so much. Recipient was very pleased with the arrangement. Her daughter said your flowers are the best. Beautiful arrangement and timely delivery. Thanks! I have been to your shop at least 3 or 4 times now to purchase an arrangement for friends of ours who were in local plays. Everytime I have come I have been greated with kindness and friendly service from the owner. The owner remembers me each and every time and goes above and beyond to give me the best all round service and beautiful flowers! Thank you we love seeing you and happy to know you have adjusted through your move so well.Lynchburg is an awesome lace. Have fun???? We did have fun, such an enjoyable play! Your flowers were hit! Thank you again!! In June my father passed away and you did an incredible job on his arrangements for my mother, my children and I. Because of this without hesitation I returned to do another arrangement for a friend who passed away in Dec. and you did not disappoint. Your arrangement was beautiful and unique and I was so happy to see the angle again. Thank you for doing such a wonderful job. I will always come back to you for my floral needs. The arrangement that you delivered to our daughter for her birthday was beautiful. You were kind and efficient. Thank you for helping to make her birthday special. Thank you so much for taking your time to let us know??? ?We loved making them for her. My mother said that the arrangement was beautiful. She was so touched and I was impressed by the personal communication from the florist in follow-up. Thank you so much! We enjoyed making your arrangement so much. We hope you all have a very Merry Christmas and blessed New Year???? I’ve used Angelic many times and they’ve always surpassed my expectations. I would always recommend them! We were so happy this morning to get your AWESOME review!! Thank you Lisa! We appreciate your business so much!!! Super friendly and thoughtful owners! Would highly recommend! Thank you for your kind review! We loved serving you! Looked like a funeral arrangement. Not at all what was ordered. Definitely did not request a gold angel in the arrangement. Malinda thank you so much for taking your time to review us. We really appreciate it! your order was upgraded . We had to go to two different wholesalers to find some alstormeria that were opened as pictured . When they are shipped in they are very tight and have an entirely different look. We added the garden roses at no charge since some of the alstromeria were so tight. Angels are our signature and have always been complimentary since we opened. They can be slipped out easily without disturbing flowers. Thank you again we loved making your flowers . Our family has ordered from here 4 different times and we've been happy with them each order. Will definitely be ordering from here in the future. Beautiful arrangement and great service. Loved the email that confirmed delivery. Thank you so much for taking your time to review us. We appreciate you! Really nicely done arrangement & great service! The process of ordering flowers on line was simple, and that is a high compliment coming from me (as I am technologically challenged!) And Angelic Haven informed me of when the flowers were delivered. My uncle said the bouquet was absolutely lovely! Great service and thoughtfulness. They delivered beautiful flowers, candy, and balloons for my Aunt's 90th birthday. They even added a little surprise for her. She was delighted and that made me very happy. I recommend Angelic Haven Floral & Gifts! Thank you so much for your sweet review! We really appreciate your time to write one. We loved meeting her she is amazing. You are most welcome. You did a great job and deserving of much praise! Judy thank you so much you made us very happy too ! The arrangement that we ordered was absolutely beautiful! Thank you for brightening a very sad time for the recipients. Thank you so much for taking your time to write this kind review. We are so happy they liked them . Julie thank you for the excellent rating you gave us You are a blessing! Working with Angelic Haven was seamless. They even phoned me to ask a follow-up question about something I hadn't thought of, and I am very appreciative of that. Cheryl THANK YOU! Have a beautiful day! I live out of state, so finding a reputable florist was very important to me. My grandmother still lives in Va so when sending her flowers Angelic Haven is my go to choice of florists. I highly recommend them! Thank you so much trusting us to do your flowers for you! We appreciate your business and so happy you were pleased. have a beautiful day ! You made mine that way! Great service and reliable! Will use again! Absolutely fabulous bouquet delivered to my mom on Mother's Day. She was thrilled. Thank you so much! Thank you so much!!! You really made us smile today! I cannot say enough about this shop. I worked with both Hugh and Debi to figure out the perfect arrangement for a girl I care deeply for. They spent time with me on it and created a beautiful display, and then Hugh delivered it to her office. The response I got was incredible. Thank you very much. Thank you! Thank you! Thank you! You have made our day by taking your time to review us ! We are building our business by word of mouth and you have honestly been a blessing to us. Thank you for allowing us to serve you. My arrangement was beautiful, and looks great 8 days later! Very pleased, and I will be sure to tell my son who sent it. I will highly recommend this shop to others. Thank you so much!! We are so excited you loved your flowers!! Tells us you really take care of your flowers. You are so kind to review us . Thank you! Thank you for your kind review ! We appreciate your business and are so happy you were pleased. My cousin loved the Birthday arrangement. This is my second post but rating by the way. Angelic Haven arranged a beautiful, colorful bouquet for my sister-in-law's birthday-- it was perfect! We are so glad that you and she liked it! Most of all thank you for taking your time to review us! My niece was pleased with the delivery. She sent me a picture and I was pleased as well. Will now know who to deal with when sending flowers in the Lynchburg area. Thanks so much. Thank you so much! It is a joy to serve you and all of our customers with the same level of care as we would like to be served. Beautiful arrangement, but when my children ordered it online then saw it when we FaceTimed they said it was not the same arrangement. I still thought it was beautiful. Thank you so much for your kind review. The vase in the picture is no longer available so we upgraded to a larger one with a diamond band which holds more flowers also. We are so happy that you were pleased . That means so much to us and again thank you for taking your time to review us. I called to request a standing spray for my aunt who had just passed away. I researched the online arrangements and chose the spray I wanted and then I contacted the florist by phone. The person who answered was very friendly and helpful. I told him when and where the spray was to be delivered. The spray was delivered, and it was beautifully done. 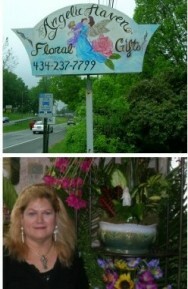 I would use this florist again, and I highly recommend them. Thank you so much for your kind review and Hugh appreciates your kind remark about him. Thank you ! He loves people and tries very hard to do his best. He is new to the business and you made his day! It was an honor to serve you during this very sad time for you. Thank you for allowing us to do that. The flower arrangement was really beautiful. It lasted a week. Thank you Nancy for taking your time to give us your kind review. Although Angelic Haven had none of the flowers pictured in the Happiness Grows arrangement on their website, the owner called me and talked through the flowers she had available. Ultimately, she produced an arrangement that was artistic, of good value and pleasing to the recipient. She did not send me a picture of the final arrangement as she said she would, but my sister sent me a picture. It was not what I had pictured in my head, but it was distinctive and attractive. I have no Idea if the arrangement was delivered. It was to a prospect and she has not seen fit to reply to any e-mail. This does not mean that she didnt get it....It just means I dont know. Your guy did call me the morning of the delivery and get ny name to put on the card....I had missed doing thisd on the web portal. I really appreciated his doing this. Thank you so much and thank you for your service for our country!!! We keep you all in our prayers always and we all owe you all so much! Beautiful arrangement. My wife was the envy of her work! Great job! Thank you so much !! You made my day ! Beautiful arrangement. The gentleman who delivered was very sweet. Thank you; imagine that, Hugh told me you were so sweet too! We appreciate so much you taking your time to review us. THANK YOU!!! The level of service I was given is unprecedented for me. Not only were the flowers amazing but they also went out of their way to deliver them after normal hours to ensure that they wouldn't be left out in the hot sun. Thank you so much!! Thank you! We are happy to do that for you! And we appreciate you!!!! Thank you so much! We loved making them and really look forward to helping you anytime!!! Thank you so much for taking your time to review us you will know how much it means to us. The floral arrangement I ordered for my wife arrived on the scheduled day and it appeared as it was advertised. Good Job! Thank you for taking your time to review. We appreciate you! Thank you!!! We appreciate you! The flowers were not exactly as pictured, but they were beautiful. My only complaint is that the balloon that we paid for was not delivered with the floral arrangement, and no refund, or even response, was received after contacting the florist. Arrangement arrived as scheduled but was incomplete. A mylar balloon was paid for but was not included with the arrangement. I will be contacting them for a refund. Thank you for letting us know. Please call the shop. We don't have your card info it was placed on line. The arrangement looked different as we upgraded you from three carnations to six roses. We had to leave the arrangement and butterfly balloon at the front counter as no one was available to walk it up. Thank you so much for taking your time to review us. We appreciate your feedback so much it helps us to improve and grow. We are so thankful all our orders were delivered by 11 am on Mothers day. Thank you !! Thank you our flowers were delivered to us late which makes our delivering later also. Iris were not available from the wholesalers at this time. On the site it explains if a certain flower is not available we may have to substitute. I fully understand your disappointment as I would feel the same way. We would love to special order them for her if possible and make an arrangement of them. Please call the shop and I will personally make and deliver them. Flowers were beautiful and service was great. The recipient was delighted with the appearance and fragrance. Thank you. Thank you so much we appreciate your business and your kindness in taking your time to review us! The azalea was beautiful. You all did a wonderful job. Keep up the good work. Thank you! We appreciate you!!! Beautiful flowers for Valentine's Day. awesome service Debbie and her staffgo the extra mile for there clients. I Got flowers for my wife for our anniversary andshe said they were the prettiest flowers that I hadever got her. Thank you so much we appreciate you a d you wife! HAPPIEST EVER ANNIVERSARY year to you both!!! Thank you so much for your kind review! We try to treat our customers the way we would like to be treated. Angelic Haven did an amazing job on the flowers I ordered. And even though the weather got bad, pretty quickly, they still delivered them. Thank you so much for your kind review! We loved serving you! We were not able to be at the house when flowers were delivered but you placed them where we agreed and we have them....good job! Thank you so much! Thankful to serve you! Debi hand delivered a beautiful birthday bouquet two days early because a major storm was coming in on the appointed date. Our cousin was delighted with the flowers, balloon, butterfly and the special touch Debi gave. Angelic Haven had been highly recommended to us, but it even far exceeded any expectations. Annette thank you for taking your time to review us We appreciate this so much! It made my day delivering to her she is so sweet! Debi is absolutely an amazing lady. She has gone above and beyond what any florist has ever done. Debi, you took "Y0UR" time to help in my time of need, after hours and all. I wouldn't ever be able to tell you how much I appreciate you! Thanks so much for your knowledge and caring too! Yes, the arrangements were amazing also. My Great Aunt Nellie (104) recently passed away and her services were in Lynchburg. We are in Richmond so we needed someone local for the flowers. I found Debi at Angelic Haven and she was amazing! She was so easy to work with and met all of our special requests. My Aunt's favorite color was pink and so we wanted to have everything in pink. The arrangements designed by Debi were absolutely gorgeous and everyone commented that they were the most beautiful flowers that they had ever seen. Debi was such a blessing to our family during this time. Mary, thank you , thank you, thank you! I appreciate so much you taking your time to review us. I was so impressed with the love and concern you and your sister conveyed by your request for everything to be what you knew your Aunt would love. It was such a pleasure to help you both! She sounded like such an amazing lady. My Great Aunt Nellie (104) from Lynchburg passed away and so I was looking for a local florist to handle our flowers. I found Debi and I am so glad that I did. My Aunt was a special lady and she needed to have beautiful flowers in her favorite color of pink! Debi not only met our expectations but she went above and beyond - our flowers were absolutely breathtaking. Everyone at the funeral commented on the beautiful flowers and how exquisite they were. Thank you Debi for being such a blessing to our family! The flowers are beautiful!!! thank you so much for putting in so much time and effort into making this a special arrangement! Thank you ! You are so kind to review us ; it means so much when customers take their time to do that! Thank you so much Donna. It was an honor to help you and your family. We received the sweetest note from Anita which is on my customer wall. Anytime I need a lift I look at those and the day brightens right up. THANK YOU!!! My wife was very please with the spa basket. It arrived when I asked for it to and I am pleased with the product and service. The order process was very easy. Thank you!! Thank you so much!!! I sent you a little note on my confirmation. You have the SWEETEST family!!!! Your wife was SO HAPPY you sent her your thoughtful gift. You are very blessed to have such love in your family. The Roses and Flowers were absolutely breath-taking! I have never seen anything so uniquely put together. I have received flowers from 1-800-Flowers.com but even they could not come close in comparison to the Angelic Haven Floral & Gifts I received! Thank you so much for making them so beautiful! I am really enjoying them! Flowers were very beautiful! I had to change when the flowers would be delivered and when I called they were very helpful and accommodating. The flowers arrived on time and were gorgeous. Thanks again for everything! Thank you so much for the time you took to review us. It was an honor to help you! You are so kind!! Thank YOU for taking your time to review us. We love to put as many extras in our arrangements as we can! I am an artist also and little details mean a lot to me. The flowers were just as ordered and delivered on time. I ordered flowers for a funeral and I was more than extremely satisfied. It was the most beautiful arrangement I have ever seen. The extra special touches, which I did not ask or pay for, made the arrangement perfect. I will recommend to everyone. After speaking with Debi on the phone and seeing the arrangement, it is very obvious she is very passionate about what she does. Extremely satisfied. Debby thank you, thank you, thank you for your kind review. I love doing funeral arrangements for families and meeting them. It truly is an honor to do this. We have used this florist twice to send flowers to our daughter at Liberty University. They have gone above and beyond our expectations both times adding extras and creating beautiful arrangements. Highly recommend them. Thank you for taking the time to review us . It really helps our business as we are basically building on word of mouth. Please except a discount on your next order and again thank you and we appreciate your business so much! Very nice arrangement and thoughtful to add a daisy, knowing my Mom's taste. Preferred the flowers to be a surprise. Unfortunately not the case as she was called. The person indicated to her they had a delivery but can't get there until the next day. I would have rather the person called me. Mr. Ford thank you so much for your review!! We personally know Lesa and Kermit and loved him so much and love her! Our delivery truck didn't make it with all the shipment being the reason for late delivery. We did flowers for Kermit's service and he loved her so much. We delivered her surprise red roses one morning at their apt. We feel so blessed to have met them both. We will deliver another complimentary bouquet for Lesa as we have done many times as she is special to us. Friendly and happy person to person delivery. Very pleased!! Thank you so much please accept a discount on your next order. Thank you so much!!!!! That means more than you will ever know! This has been one crazy Valentines! Seems I don't know how to say no and at valentines that can make it crazier but you made our day!!! You are the bestest ever!!! My friend loved the arrangement. There was even a little gold angel put in it. Wonderful service. Thank you. Thank you so much for your review! We appreciate you taking your time to write this. Please except a discount on your next order. Thank you. Thank you so much ! We appreciate your business and please accept your VIP status for taking the time to review us. Discount on your next order. Found this shop online as I live in Maine and my sister had knee surgery in VA. My sister commented that the flowers sent to the rehab were the most beautiful arrangement she had ever seen. High praise from one who is in two garden clubs! My order was reasonably priced, and handled professionally with attention to detail (my sister likes, etc.) I highly recommend this florist. I have never received flowers as beautiful as the ones from you! Highly satisfied and have shared our feelings with others. Thank you very much! Thank you! you are V.I.P. to us and we appreciate your business so much. thank you so much! We loved doing them for you:-)please accept a discount on your next order . We appreciate so much taking your time to review us. I ordered flowers for my moms birthday and not only was the arrangement magnificent but the delivery experience was exceptional! It was a cold day in Lynchburg and no one was at home for the surprise delivery. Angela called repeatedly to make sure someone was home before leaving in the cold. This was my first time ordering from Angela. I've always ordered from Leo's or Doyle's. From now on it will be Angela! I ordered flowers for my mom on my mom and dads anniversary. He passed away in 2013 and she recently had to move halfway across the states for a new job and was really bummed out. I was very happy with the arrangement she got and the fact it got there on time. Flowers were very beautiful and well worth the money. Thank you so much for your awesome review! You made my day awesome too. Please accept your V.I.P. status and discount on next order. The flowers were sent to my daughter. She told me they were beautiful. You also did a great job of contacting her before delivery. I will order from you again. You are V.I.P. Thank you so much ! I'm so glad she liked them. Please accept a discount on your next order. Thank you so much and I am so glad you were both happy. Please accept your V.I.P. status and discount on next order. We appreciate you taking the time to review us!!! Was a crazy day and you made it so much better!!! Debbie is just fabulous and my daughter LOVED her birthday flowers. They were absolutely gorgeous!!! Thank you so much Debbie for making my daughter Kasey's birthday so special!! thank you for the great flowers in my time of need. My Grandma absolutely loved this bouquet! I am very impressed with the quality and absolute beauty of your arrangements. I love being able to order and pay online. The online pictures do not do your arrangements justice. Thanks for being so phenomenal. Thank you so much! We loved doing flowers for you! Taking the time to review us is so appreciated. You made my day!You are V.I.P. and will receive discount on your next order. Thank you! Angelic Haven Floral Gifts staff went the second and the third mile to ensure that what I wanted would be delivered. I found their service to be unbelievably wonderful. A big thanks for making my wish come true!! One of the best experiences with orderingflowers. I explained what I wanted and why I wanted it and the receiver absolutely fell in love with the plant. Even posted picture on Facebook. They are angels. Barbara thank you so much! We appreciate you taking the time to review and show our work on your FB! Please let us know if you need us again and you will receive V.I.P. service and discount ! Thanks again! Outstanding customer service!!! Debi cares about her clients and demonstrates this with her attention to detail, efficient manner and personal touch. It is refreshing to do business with some one who loves what she does and passes that along every step of the way. Thank you, Debi! Outstanding. The owner and employees obviously truly care about more than doing business. They care about people. You all went above and beyond! I'm overseas and you all delivered the flowers on time and posted the card on your billboard so thank you very much! I was very satisfied with my purchase and how you all played it out! You all are amazing! Nathan thank you so much for taking your time to review us! We appreciate you and will always receive V.I.P, service and discount. Please forgive the HUGE balloon. Story behind that is fast escape of the first one.. Way ..way up I was told; hence Mickey saved the day. I am extremely pleased with my entire experience with Debbie. From beginning to end, she was responsive, friendly, and efficient. And she texted me a photo of the balloons for my stepdad. Impressive! I love the personal touch that she offers, especially interacting with her from Massachusetts as it is difficult when you cannot be there in person. Thank you, Debbie. Love, love, love this florist! Jackie thank you so much for taking your time to review us. I remember him well and it was an honor to meet him when I delivered them. Your love for him he felt. Please let us know if we can be of any help to you. You are V.I.P. and deserve that kind of service and our discount. Thank you! Possibly the best customer service I have ever experienced anywhere. I live in Florida and looked up reviews on local florists to have an arrangement sent to my girlfriend. Debbie was cheerful, friendly, and went out of her way to help me. Both the product and service were personalized. She took pictures of the arrangement and receipt and called to follow up. She went out of her way to make this special for my girlfriend and affordable to me. I will definitely be using her again in the future. Debbie really seemed to care about people and what she does-- I would highly recommend her. When I'm in Virginia I won't use anyone else. Rebecca thank you so much! I remember you both so well! I too was impressed with your sweet personality. It was so important to you that this be so special. We loved filling your order and personally delivered it. Thank you Rebecca I hope you are both doing GREAT!! You are V.I.P. to us and will receive that service and discount! Perfect, beautiful flowers and great customer service. Owners made me feel wonderful, both were very friendly and sweet, they went over and beyond to make my day special, was so happy with the service and will be back in future. thanks you so much!! Absolutely fantastic service. The flowers were custom & spectacular. I live in N.C. but wanted flowers for my daughter in Virginia. I got same day delivery & wonderful, caring service! Beth thank you so much for your kind review! It means so much to us and it was an honor to help you. You are V.I.P. and deserve that service and discount. Please let us know if you ever need us! Beautiful flowers and excellent customer service. I love this floral shop, the owners are wonderful and sweet. They go over and beyond to provide the best. I stopped by to pick up flowers for my daughter as a suprise. Thank you so much for making our day! Amy thank you! I remember you so well and you are an awesome Mom! thank you for taking your time to review us! You are V.I.P. here and will get our V.I.P. service and discount ! Thanks again Amy! !